If you have low HDL and high triglycerides, your doctor has likely advised you to modify your diet in order to raise HDL and lower your triglycerides level. There are several ways you can achieve these goals, both of which will help to prevent heart disease and atherosclerosis, or hardening of the arteries. The reason it's important to eat a diet that will help you raise your HDL and lower your triglycerides is that unhealthy levels of blood lipids — of which HDL and triglycerides are both examples — leads to poor cardiovascular health. The American Heart Association recommends that your triglycerides level be as low as possible, since you make LDL — also called "bad cholesterol" — from triglycerides. HDL helps you clear cholesterol out of your body, so you want as much of it as possible. It's quite difficult to raise HDL through diet alone, though it's certainly possible to avoid lowering it. Certain kinds of fats tend to decrease your HDL, so you want to avoid them. Specifically, saturated fats — found in animal products — may lower HDL. Trans fats, which occur in processed foods and anything with the phrase "partially hydrogenated" appearing in the ingredients, also significantly lower HDL. As such, avoid saturated fats as much as possible, and trans fats entirely, suggests the American Heart Association. Replacing saturated fats with monounsaturated fats -- the type of fat found in nuts and olive oil -- may help increase HDL cholesterol. The same things that help you raise HDL also help you lower triglycerides. Avoiding saturated fat and trans fat can significantly impact your triglyceride levels, helping to adjust your blood lipid profile favorably. 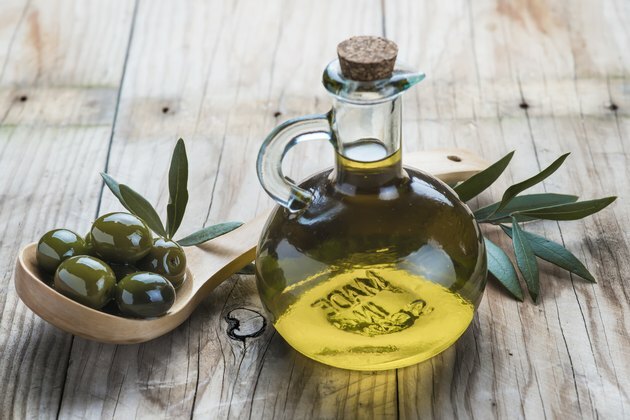 You can replace the saturated and processed fats in your diet with heart-healthy unsaturated fats such as olive oil and other plant-based oils. These oils don't decrease HDL and don't contribute significantly to triglycerides in the bloodstream. If you have low HDL and high triglycerides, another important component of diet is fiber. Fiber, particularly the soluble variety found in many fruits, vegetables and some whole grains, helps to bind cholesterol that you consume and prevents you from absorbing it in your intestine, explains Dr. Lauralee Sherwood in her book "Human Physiology." This promotes good heart health and can help to offset the unhealthy effects of low HDL and high triglyceride. In addition to a healthy diet, you should also add exercise to your lifestyle if you have low HDL and high triglycerides. A 2001 article published in "Arteriosclerosis, Thrombosis, and Vascular Biology" by Dr. C. Couillard and colleagues notes that regular, hard exercise — 30 minutes, three or more times per week — can help improve lipid profiles through increasing HDL levels significantly. In fact, exercise is one of the single best ways to increase your HDL levels and improve heart health.